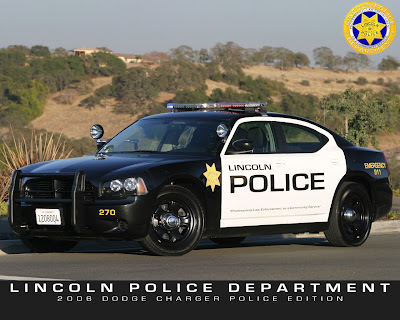 Licnoln PD was the first local law enforcement agency to have the Dodge Charger. Auburn followed. And now the CHP. I remember hearing a story from a friend of mine, who is a sergeant for the CHP, about the Dodge Charger; it was about a year ago. It had to do with Dodge not paying for a crash test the CHP required. Well, either Dodge finally paid up or the CHP found another way to get the needed test results. 88 unmarked (at this point) Dodge Chargers have been spotted at the CHP's Fleet Operations Facility in Sacramento. This picture is from a story posted at Winding Road, a favorite car blog of mine. Personally, I love the Chargers. And I think vehicles that meet or beat the Crown Victoria usefulness should be looked at for law enforcement. The Vic is so noticeable as a COP car.